Ancient Egypt, Saite Period, Twenty-Sixth Dynasty (XXVI), ca. 664 to 525 BCE. 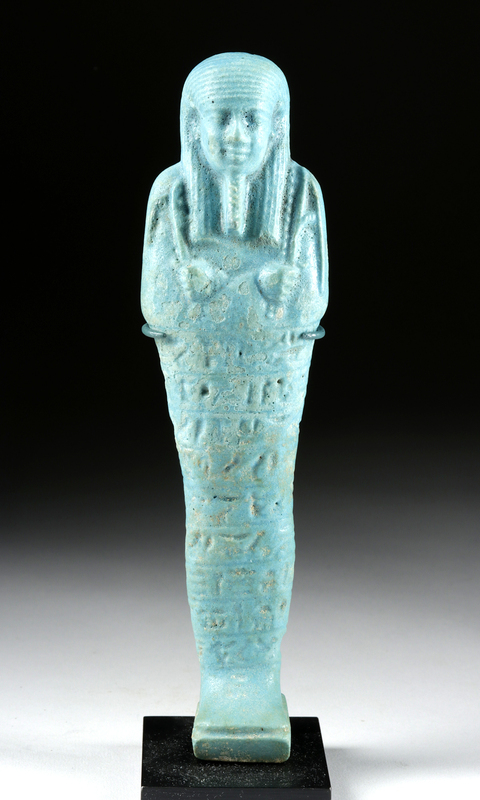 An excellent example of a well-made faience ushabti, inscribed with a personal prayer of protection, indicating that it belonged to an elite woman, rather than being one of the mass produced and generic ushabti that we often see from this period. 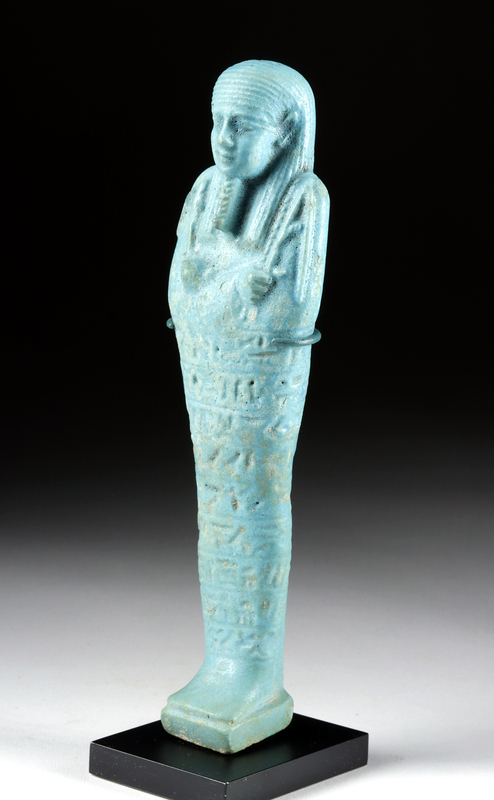 The artist who created this piece used copper to create a gorgeous sky blue faience glaze that coats the mummiform body of the ushabti. Dense hieroglyphs around its lower body form a prayer for the afterlife. Size: 7.625" H (19.4 cm); 8" H (20.3 cm) on included custom stand. 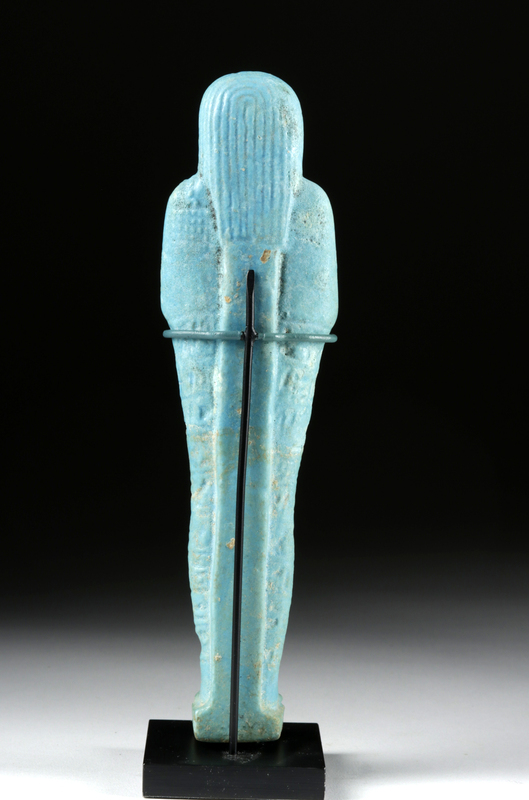 Ushabti are figures shaped like adult male or female mummies wearing traditional ancient Egyptian headdresses. The ancient Egyptians believed that after they died, their spirits would have to work in the "Field of Reeds" owned by the god of the underworld, Osiris. This meant doing agricultural labor - and it was required by all members of society, from workers to pharaohs. 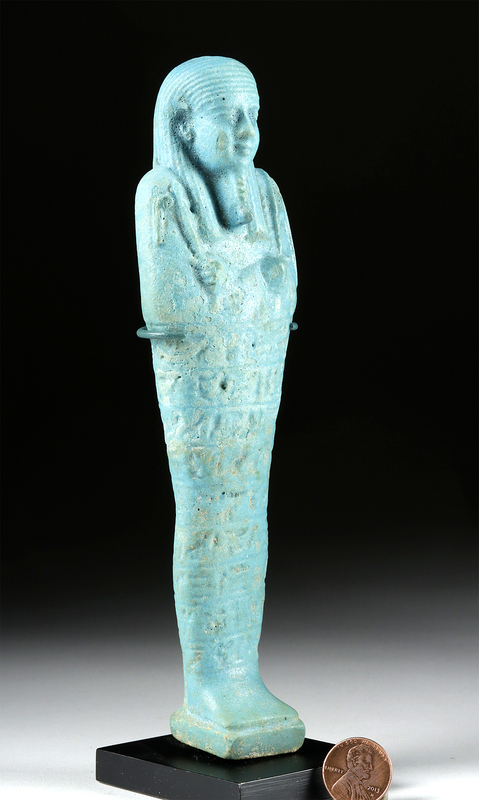 The wealthier nobility in Egyptian society were able to have shabtis made of faience; blue faience was meant to reflect the color of the river Nile both on earth and in the afterlife. Condition: Intact and generally excellent. Glyphs a bit worn, an indication this was made toward the end of the molds life.